Donald Kent (Deke) Slayton was born on March 1, 1924 to a local farming family in Sparta Wisconsin. Growing up Deke always knew he wanted to do something more with his life than farm. Pearl Harbor was bombed during Deke’s senior year in high school, and after graduation in 1942 he joined the military and became a pilot. During WWII he flew over 50 combat missions in Europe. After the war he attended college under the G.I. bill and graduated from the University of Minnesota with a degree in aeronautic engineering. Finding civilian life and employment a bit dull, when the Korean War began he rejoined and served as a military pilot once again. In 1955, Deke transferred to the Edwards Air force Base in California and became a test pilot for new prototype airplanes. In Wisconsin Deke was always called Don. At the air force base another pilot was also named Don, to differentiate the nickname “Deke” developed as a combination of his first and middle name (Kent). While at Edwards, the Russians launched the satellite Sputnik. As a result, in January 1959, Deke was requested to report to Washington, D. C. for a classified briefing. The idea of “astronauts” was formed, and the space race began. After months of extensive training and testing the newly formed NASA narrowed down the pool of military test pilots from 500 astronaut candidates to just seven. Having survived the rigorous test and requirements Deke Slayton became one of America’s first astronauts, part of the Mercury 7 group that was formed in 1959. Deke was thrilled, and excited to be part of this new challenge and adventure. Over the next several years Deke distinguished himself, and was slated to be the next on one of the early Mercury Missions. However, during routine medical tests doctors found a very slight irregularity in Deke’s heartbeat. After much debate amongst NASA officials and intense political pressure, Deke was taken off of active flight duty and grounded. Deke was devastated, but always the team player, he stayed on at NASA and became Coordinator of Astronaut Activities. 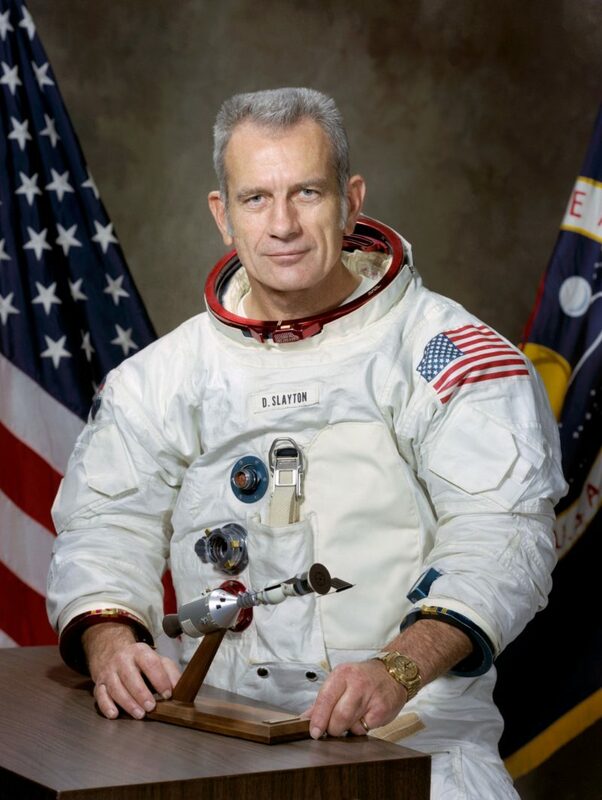 Deke proved himself to be an excellent manager and was instrumental in choosing the next crop of astronauts, the training they received, and designating the teams for missions. Deke had a hand in the entire Apollo Program, he put the right people in the right places at the right time. He chose Neil Armstrong to be the first man to walk on the moon. Thanks to a healthier lifestyle Deke’s irregular heartbeat went away, and after 10 years on the ground he was restored to active flight status. Deke was assigned to the Apollo-Soyuz mission, the first international docking mission between the US and the former USSR (Russia). In his mid-fifties, Deke joked about being “the oldest rookie” ever to go into space. This mission was important for diplomatic relations because America was in the Cold War with the USSR (Russia), and the mission paved the way for the International Space Station and many other joint missions to come. After landing Deke knew his days flying were over, so he worked on the space shuttle project, eventually retiring from NASA in 1982. Despite his retirement, Deke still flew planes, including formula one airplanes. After a full life and exciting career, Deke Slayton succumbed to brain cancer on June 13, 1993 at the young age of 69.